There are many factors to consider while going to S/4 HANA. This posts analyze the options for on-premise S/4 HANA and the possible implementation methods and their influencing factors from Finance perspective. If you are a new customer to SAP and going for S/4, it is a greenfield implementation. Please note that the migration tools provided by SAP are only for migrating the existing customers data to S/4 HANA. In case of a greenfield implementation, you can not use these migration tools for migrating the data to S/4. The classical data migration tools are to be used in the case of greenfield implementation. Following are some general considerations if you are already running SAP and interested in migrating to S/4. Remember to cancel any periodic jobs. Postings are not permitted between S/4 installation and migration. 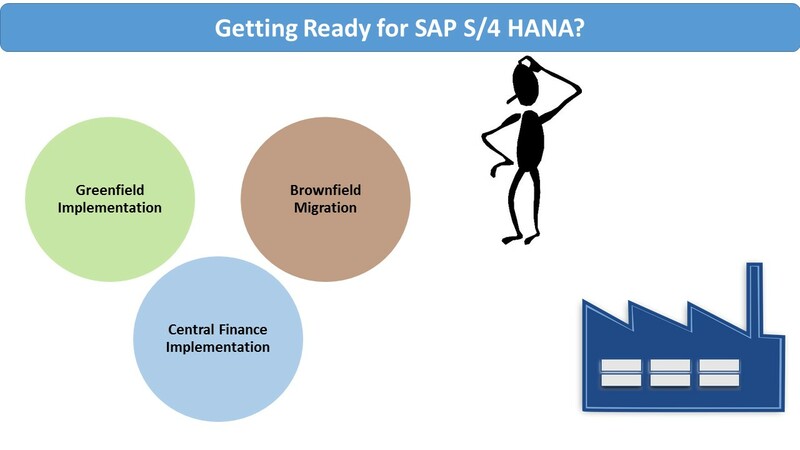 Below is a high level overview of preparatory tasks that are needed for S/4 Finance migration from earlier SAP ERPs in a brownfield implementation option. These tasks can vary depending upon the modules implemented, level of customization, current system version, complexity, etc… The idea here is to provide a high level understanding of the preparatory tasks specific to S/4 Finance migration. The tasks are grouped by the following areas. Each area has the tasks, pre-checks, OSS Notes, SAP best practice recommendations and document links where relevant/applicable. Reconciliation ledger is no longer needed to reconcile between FI and CO. All actual CO postings are updated in universal journal (ACDOCA table). There are exceptions, i.e. COEP still gets populated with data that are not posted to universal journal. The secondary cost elements are now created as GL accounts as well to eliminate the reconciliation needs. In the classic GL, the valuation difference for all open items must be empty. If not, reset the valuation prior to S/4 installation. If this is not done, stored values of all open items will be posted for second time with the new valuation program. The New Asset Accounting is required in S/4. The Enterprise Extension EA-FIN and FIN_AA_PARALLEL_VAL must be activated. For all additional currency types in company codes, there should be a depreciation area setup. Please note that Application Link Enabling (ALE) to transfer assets is no longer possible after migration. Please note that the closed fiscal years in FI:AA can not be reopened after migration due to structural changes. Perform period end closing activities including periodic asset postings and depreciation. If you are planning to implement only S/4 Finance as the Central Finance architecture, Customer Vendor Integration (CVI) is not mandatory. If it is a full S/4 HANA migration, CVI is needed. Costing based CO-PA work as before. However, SAP recommends to move towards Accounting based CO-PA to eliminate the reconciliation. Activation of “Material Ledger” is required for S/4 HANA. Possible separate mini project? A separate COS ledger and Consolidation Staging ledger are no longer needed. Reporting tools and systems used, i.e. BI, BOBJ, etc..
Hi Krishna, Thank you for informative document. Q1) Under the 1st point, you mention that “It is not mandatory to have new GL to implement S/4.” However in the 2nd point under asset accounting it’s mentioned that new asset accounting is required in S/4 also that for RASFIN_MIGR_PRECHECK there’s a check for activation of new GL. These points look contradictory to me. Please see my response for your questions below. Q1. If asset accounting is not used, upgrade to new GL is not mandatory. But if asset accounting is used, then new AA is needed for S/4 which in turn requires new GL. Q2. Upgrade to EHP7 prior to S/4. The recommended approach is to do the EHP 7 first and then migrate to S/4. thanks, it is really a good and useful document. You are very welcome Dawit Desalgne.